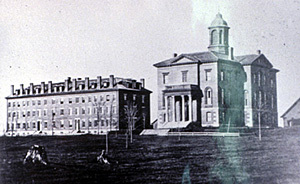 Hathorn Hall, completed in 1857, is Bates’ first building, as well as one of Lewistons 21 locations on the National Register of Historic Places. It is named for Seth and Mary Hathorn of Woolwich, whose several donations made its construction possible. Including housing both the Math and English Departments, Hathorn Hall also boasts the iconic bell at the top of its Tower which rings at the beginning of each day and can be heard all throughout campus.